OCD, Vampires, and Rants, oh my! 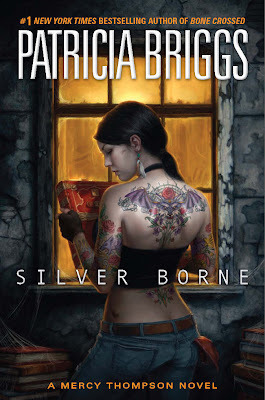 reports that Patricia Briggs has posted the cover to Silver Borne, the fifth Mercy Thompson novel on her website. No blurb information available yet. 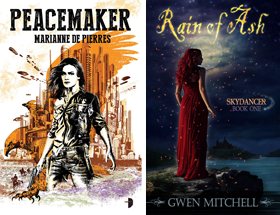 Patricia on her site says that, "ACE has contracted for a total of seven Mercy novels, and it's possible the series could go even longer". Silver Borne releases March 30, 2010. Gorgeous tattoos, even nicer than the artwork for Iron Kissed. Anyone? Ohmigod. I love it. I LOVE IT. It's even more gorgeous than the previous ones. Yes!!! I am so looking forward to more Mercy books. Thanks for the heads up! Simply gorgeous! Can't wait for this one. Thanks so much for posting this! This has just made my day! The Mercy Thompson series is an absolute favorite - I am addicted. Daniel Dos Santos has seriously outdone himself - I didn't think he could top the 'Bone Crossed' cover art, but he has left me gob-smacked. The man is a freakin genius! But, I think the UK version of Silver Borne is a better representation of who Mercy is IMHO. What a gogeous cover!!!! LOVE LOVE LOVE IT! I just ordered this book on Amazon (they could basically auto-preorder anything from Briggs for me, anyways :P ), so it's nice to see a great cover for this too. Yeah, it's beautiful artwork, and it's good to see the style continued through the series. Wendy at least we have Hunting Ground to tide us over. Brooke Dan Santos for sure. Love his work Colors are so vivid. Great books, great covers Mandi. Renee March is perfect timing for here in Canada to get us through the last of winter. Danielle I agree that this betters already great covers. Donna I just had a look at the UK cover. Very urban and atmospheric. I get the mechanic bit but I think Santos captures the native American sensibility which I think is important too. Rachel wouldn't this make a great poster? Jayden definitely a terrific set of covers. This is one of my favorite series, and I love all the covers. I love the tattoo work on the character, even though in the book Mercy only has one tattoo. :) I'm glad that there will more books. Mardel in the case of Mercy I think the tats are more spiritual than real. I personally am not particularly fond of this cover.. not that it isn't great art... But is it Daniel Dos Santos? I ask, because it doesn't quite match his style, which definitely captured Mercy's earthy feminine qualities and set a standard in the prior 4 books (It was the cover of 'Iron Kissed' which had originally drawn me to the series). I do like how the tattoos have changed with each book, reflecting the context of the story within rather than being permanent relfections of Mercy herself. Though I feel these tattoos are a bit more flowery and feminine than Mercy would be, they still hold that presence. Though I think it is important, especially for me, to remember that the covers are meant to capture a particular mood and presence - hence the changing tattoos or slightly sensual quality to Mercy's wardrobe and poses. Regardless, I'm ecstatic with anticipation for this book's release. Joyelle the cover is definitely Dos Santos. I myself didn't perceive it as being much different in tone but hey. A new Mercy is always something to look forward to.